Please re run TDSskiller and choose delete then post that log I need to see it. Also how is your machine running now? Looks like TDSSKiller picked up a bad driver and deleted it. Your logs look good lets do some final checking. Please download Malwarebytes' Anti-Malware (v1.50) and save it to your desktop. Malwarebytes' may "make changes to your registry" as part of its disinfection routine. If using other security programs that detect registry changes (ie Spybot's Teatimer), they may interfere or alert you. Temporarily disable such programs or permit them to allow the changes. Make sure you are connected to the Internet and double-click on mbam-setup.exe to install the application. Note: If Malwarebytes' encounters a file that is difficult to remove, you will be asked to reboot your computer so it can proceed with the disinfection process. 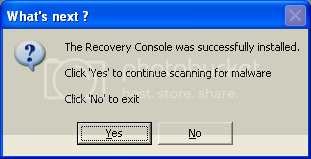 If asked to restart the computer, please do so immediately. Failure to reboot normally will prevent Malwarebytes' from removing all the malware. sorry about the late reply I'll be doing the 2 scans today. The virus hasnt popped back up since monday so it seems to be gone! I'll post the logs later today!